Congratulations to Iana Simeonov and Michael Winokur, directors of Selling Rosario, who won the Best of Fest award for the Cook County Jail Women’s View Festival! "The Watch Yourself program had a truly competitive line-up, with all films getting lots of votes" said ICMC director Nicole Dreiske. A crowd favorite for its emotional storyline, Selling Rosario tells the story of a family of migrant workers who prepare their daughter for a life-changing night that isn’t quite what it seems. The ICMC has published three eBooks building on methodologies created by Director, Nicole Dreiske, and outlined in her first three books. The newest Movies Make You Smarter™ provides invaluable resources for working with youth 14 and older, while the second Mindful Viewing™ book offers rich female-focused content. Screen Smart™– Five Day Intensive Curriculum makes Dreiske’s revolutionary techniques available to teachers, instructors and facilitators. Call us at 773-528-6854 to purchase eBooks or click the links above. Protect Kids’ Minds with Two New ICMC Books! 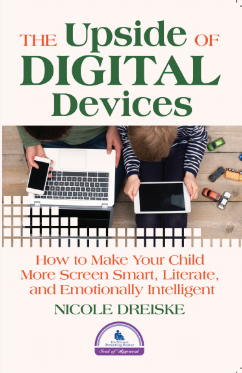 Author and ICMC Director Nicole Dreiske has released two powerful new eBook resources for parents, teachers, and youth leaders alike. Movies Make You Smarter™ guides educators to lay the foundations for a powerful learning relationship with screens. Mindful Viewing™ opens the door to real dialogue around screen time, providing values-focused techniques to open children’s hearts and minds while using digital devices. Call us at 773-528-6854 or click Mindful Viewing™ and Movies Make You Smarter™. The ICMC’s acclaimed Screen Smart™ program teaches children healthy screen habits and accelerates learning in early childhood classrooms. Field-tested for seven years, Screen Smart™ boosts literacy, empathy and self-regulation with a unique curriculum that helps stop screen addiction before it starts. Start today and close the achievement gap for children who are challenged, while building skills for gifted and mainstream students! Studies show that screen time can stunt compassion, literacy and grit in early childhood. Parents see the distressing outcomes in dull-eyed kids who lack interest in school and may bully others. Help is here! Mindful Viewing™ workshops are now available for churches, synagogues, parent groups and community centers. Learn about Mindful ViewingTM workshops here! Chicago area schools are leading the charge to 21st century skills! Five forward-thinking CPS principals have been awarded coveted Screen Smart™ Accelerative Learning Residencies, providing 5-8 classrooms in each school with big upticks in literacy, empathy and self regulation. Jungman Elementary (1746 S Miller St) with principal Suzanne Luzzi at the helm. A special shout-out to the brilliant AP’s and counselors, Jennifer Sanks, Karen Jones, Dr. Iva Lane and Abigail Zureich who identified Screen Smart™ as a “must have” for their schools. Parents, here’s some exciting news to make your job easier! Nicole Dreiske has offered up more of her life-changing tips for 21st century parenting! Check out the Screen SmartTM Chapter in Christine Martin’s new book, YOU’VE GOT THIS: Keys to Effective Parenting in the Early Years. • ScreenSmart™– Accelerated learning program for preschools and elementary schools. Ages 2-9. • ICFilmFest– This unique touring event introduces families throughout the Midwest to high quality international film and global perspectives. Ages 2-11. •Global Girls & Women’s View- Films for, by and about girls and young women in shelters, and jails. Ages 13+ Global Girls is supported in part by the Academy of Motion Picture Arts & Sciences prestigious FilmWatch program. Entry fees: $75/short film and $125/feature film. Groundbreaking Screen Smart™ Techniques at NCEA 4/23 & 4/25! ICMC Director and digital media expert Nicole Dreiske teaches on April 23rd and 25th for the National Catholic Education Association Conference at McCormick Place. On April 23rd, at 11am Nicole presents the high energy workshop, INSTANT RECESS - What To Do When Students Get Wiggly, with break-through methods like “rapid-scaffolding”, priming, and “plosives”. On April 25th at noon, Dreiske will give a Central Chat demonstrating the revolutionary Screen Smart™ approach, followed by a book signing. Shout Out to Jamila Woods! The stunningly talented Jamila Woods recently gave the ICMC permission to use a segment of her brilliant song Zora in the ICMC’s short film INSIDE, produced by female detainees in Chicago’s Cook County Jail. Thank you, Jamila! Jungman School is Screen Smart! In partnership with Joseph Jungman Elementary School, the ICMC will present nine adorable short films from six countries that are fun for the whole family! The unique media program boosts empathy and brain power while working towards healthy screen habits. Join us for the May 16th Festival at 12:45PM! Free for all Jungman students and parents. Meet the ICMC’s New Publicist! Ann-Marie Nieves, founder of Get Red PR is an award-winning communicator with experience across a broad range of industries. Ann-Marie excels at launching new businesses and is the perfect fit to help the ICMC bring Screen SmartTM and Global Girls to scale! Click here for more about Get Red! Thanks to the generosity of a Colorado-based funder, the ICMC will bring Global Girls to a shelter or youth service agency in Denver. Three agencies have already signaled interest and ICMC director will visit Denver at the end of March to launch the program. Contact us about bringing Global Girls to your city or agency! How to have great talks with kids about movies, apps, games and digital safety. Ways to help children to build their own media “filters and controls”. Fun exercises to make kids self-aware during screen use. Simple steps for using screen time to build vocabulary, empathy and literacy skills. Tips to strengthen family values while using digital devices. Winner of the National Parenting Center’s Seal of Approval, THE UPSIDE OF DIGITAL DEVICES makes Screen Smart™ fun, easy and affordable for parents. Buy the ebook here. Movies Make You Smarter™ at ICFilmFest Screenings! The ICFilmFest has a new partner! Now, Movies Make You Smarter™ will open and close every ICFF screening. This neuroscience-based approach changes brain chemistry during screen time so even the youngest children learn healthy ways to use, view and engage media. Each event provides children with digital wellness techniques they learn at festivals and practice at home! Click here to book Movies Make You Smarter™! After hundreds of votes were counted, Hedgehogs and the City (Latvia), directed by Evalds Lacis, has won the Best of Fest Prize at the 3rd Annual Northbrook ICFilmFest, held Saturday, November 24th at the Northbrook Library. In this charming stop motion film, a group of animals led by two clever hedgehogs, collaborate to reclaim the homes they lost when a city was built. After interviewing four agencies as prospective partners for the landmark Global Girls/Women's View therapeutic arts program, the ICMC has selected Cook County Jail as the site for the next Women's View residency. With more than 200 films identified for the 2018 program, Women's View promises to deliver transformative experiences for women in Tier 2 at the CCJ. Supported by the Academy of Motion Picture Arts and Sciences, the program trains court-involved females in vital 21st century skills and provides economic opportunities that lead to employment. Help Keep Kids’ Minds Awake! We’re on a mission to help kids LOVE learning -- won’t you join us? Make a donation today to help the ICMC bring Screen SmartTM to children around the country. $150 supports one Screen Smart session for an impoverished early childhood classroom. Click here to become a donor!